BANGI, 5 July 2012 – The National University of Malaysia (UKM) is to set up a Chair funded by Malaysian Palm Oil Board to undertake research to make the palm oil industry in the country not only more profitable but environmental friendly as well. 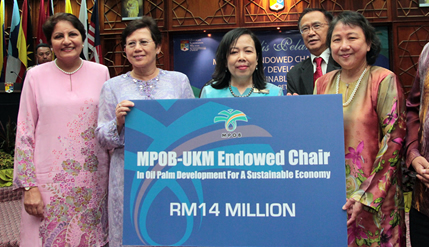 The Board is to provide grants totaling RM14 million to UKM for The MPOB-UKM Endowed Chair in Oil Palm Industry Development for a Sustainable Economy aimed at providing the leadership in research which will complement studies on palm oil already being carried out at MPOB. The grants will be disbursed in three instalments, starting with RM8 million soon and two subsequent tranches of RM3 million each. A Memoranda of Understanding (MOU) was signed here today by Vice Chancellor of UKM, Tan Sri Dato’ Wira Dr Sharifah Hapsah Syed Hasan Shahabudin and MPOB Director-General, Datuk Dr Choo Yuen with Deputy Vice-Chancellor (Industry and Community Partnership), Professor Dato’ Saran Kaur Gil and MPOB Deputy DG, Dr Ahmad Khushairi Din attesting as witnesses. Secretary-General of the Plantations Industry and Commodities Ministry, Datin Paduka Dr Normah Abdul Rahim officiated the signing ceremony representing the Minister, Tan Sri Bernard Giluk Dompok, who could not attend. Two Chairs for research related to the palm oil industry both financed by the Sime Darby Foundation has already been set up in UKM. One is the Sime Darby Foundation Chair on Climate Change while the other is the Sime Darby Foundation Chair on Zero Wastes. This latest development further strengthened UKM’s credentials in undertaking research on sustainable development of the palm oil industry. It also reinforces cooperation between the two institutions which have worked together since the 1980s. The new Chair will set its sights on four key areas of research, (i) Policies and Regulations; (ii) Income and Commercial Potential; (iii) Society and Community and (iv) Sustainability of the Environment. All the four areas are deemed vital to the industry. The person who will occupy the Chair has not been named but sources said several candidates were being considered. He is expected to bring a lot of experience and networking which would lay down the direction for UKM and MPOB to do the research. The industry has many scientists and researchers in public universities, government agencies, corporations, research centres and non-governmental organisations (NGOs). The chair will foster cooperation and strategic collaboration for economic development. It will also upgrade expertise and skills through supervision, training and instruction. The Chair will contribute to the formation of policies and the dissemination of information. Public lectures, seminars and workshops on how to further empower the industry will be organised with courses conducted for relevant partners. Scientific discoveries and innovations will be published in high-impact journals in order to reach the palm oil research community worldwide. The formation of the Chair is also likely to stimulate academic activity and capacity building. The research done under the Chair will combine research and post-graduate studies. It is also hoped to improve local expertise, especially in the sustainability of the oil palm industry. However, all these ambitious plans will not take off without increased funding and endowments in order to have continuity. The person who occupies the chair will also have to persuade investors and fund-raisers from various sources such as research grants from the government and private sector, at home and abroad.